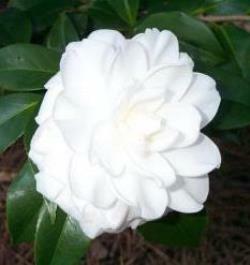 View our entire selection of Camellias including Japonicas, Sasanqua Camellias, Camellia hybrids, and Tea Camellias. These are durable and long-lived evergreen shrubs that make easy and low maintenance additions to gardens, landscapes, as bonsai, and even as container plants. 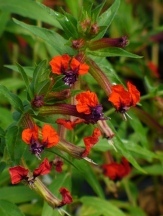 These are fall, winter, and spring flowering machines with few pests or diseases to worry over. 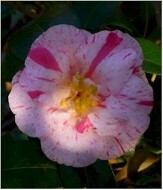 Find the Camellia you've been looking for or even Camellias that your grandmother or grandfather grew. An Almost Eden exclusive introduction! Almost Anita produces large to medium sized soft pink, double flowers that are heavily marked, streaked, and striped with bright fuchsia. 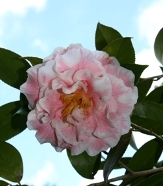 It is an early flowering Camellia that blooms in December and January. We believe that Anita is likely in its parentage as it shares a similar form and flowering time as well as the flecking. Item# 10174. Directly translated Bella Romano means Roman beauty and variously described as "magnificent", "of the largest size", and "of the class, perfection". Bella Romano produces large to very large, formal double to peony, light pink flowers that are heavily streaked with carmine and are borne late in the season on a rounded to upright plant. An antique beauty that is still highly regarded as one of the best! Item# 10846. 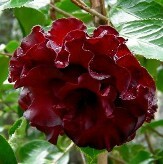 Black Magic is sure to cast a spell on anyone gazing upon its deep dark red, wavy petaled, double blossoms. 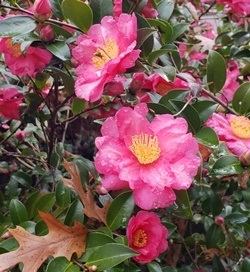 Some flowers may show off the brightly contrasting yellow stamens.The rich green, serrated holly-like foliage adds to this Camellia's beauty and uniqueness. Mid to late season flowering with an upright to spreading growth habit. Item# 10540. 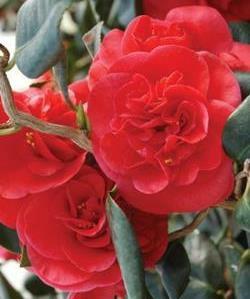 Deep reddish pink 3" blossoms adorn this beautiful evergreen shrub in mid-late fall. The fallen petals create a beautiful blanket beneath the dark green glossy foliage. An easily grown and hardy shrub with deep dark green glossy foliage with a medium sized evergreen spreading to upright habit that lends itself to shearing and shaping. Item# 9479. A pink sport of Elegans (Chandler) Variegated with large to very large anemone form blooms that sport a boss of yellow stamens are borne in early to mid season. 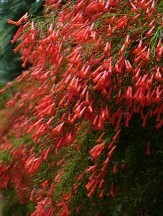 A large spreading evergreen shrub. Item# 9123. 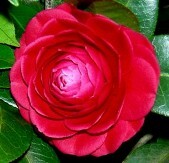 Large double to semi-double blooms of medium pink are randomly splashed with a soft pink are borne in mid-late spring. 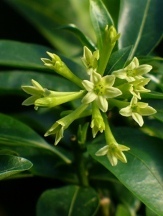 An easily grown evergreen shrub with rich green foliage. Item# 9110. A profusion of clear red semi-double cupped flowers are borne early in the season and just in time for this evergreen to show off for Christmas and New Years. 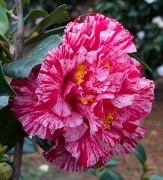 Christmas Beauty Camellia is a vigorous growing and compact Camellia with an upright to spreading growth habit and healthy rich deep green foliage. Item# 9131.